This first one is a target for my 6 year old. Ours sits on a three tiered frame so we can use it for baseball pitching and football aiming (and a new discovery...the sling shot!) Or we can use it for a game my husband built 2 summers ago that uses golf balls on rope. We make up different points for different distances and bars---and we usually use two sets of frames one in front of the other to make it more challenging. The kids love it but we've also used it at family parties where all the adults want to play. Ok...so how do you build the frame? When we use the frame for just a target we take out the middle bar so the balls don't bang into it. And you don't really need the bottom bar (although we keep it in during target practice for added stability). So there you have it...no middle bars...smaller list and easier to assemble. And either way it will work for your target. ***Note: You can glue all the pieces together if you want, but we don't. We like to take them apart to store them during the winter months. Next I sewed on some ribbon (the most boyish kind I could find in my stash) to the top on each side so I could attach it to the frame. Then I painted it with some fabric paint (which you can buy almost anywhere---I've even seen it at Wal-Mart). Ok... so NOW your done. It sounds a little complicated but this project is so fast and so easy to make your boys will be playing in less than an hour (especially if it's hot enough outside to dry the paint quickly). Alright...if that wasn't enough PVC pipe building for you here is the summer hit on our street. For this project we cut PVC pipes in different lengths and then drilled holes everywhere. So there you have it...3 of our favorite PVC projects for kids for the summer. They are all super easy to make and at least one of these is used everyday here at our house. I'm so glad we were invited to share some of our ideas. Spending time---fun, creative time with our children is one of the greatest joys in life. 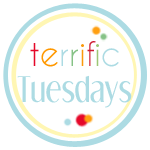 And we are looking forward to all the other great ideas coming up on Terrific Tuesdays! Those all look super cool! I love them! Thank you again for inviting us over for Terrific Tuesdays! We love this idea!